There are two ways to get source code of a COIN-OR package: Archive files or ​subversion. For typical users, using archive files is simplest. Archive files are available for release versions. For users interested in getting recent bug fixes without having to waiting for a new release version of the code, using subversion is required. Archive files are not available for stable or trunk versions. The source code usually comes with the directory structure explained here. If you have problems, have a look at the troubleshooting page. NOTE: If you plan to use the configure script and Makefiles, the path to the directory into which you download or extract the source code must not contain white spaces. Archive files for point releases of COIN-OR packages can be downloaded from the corresponding directories in ​http://www.coin-or.org/download/source. Their names have the form Pgk-x.y.z.tgz where Pkg is the name of the package. Selecting the largest version number (i.e. the most recent archive file) is usually the way to go. If you don't like the name of the extracted base directory, you can rename it, but do not rename any directories inside the source code tree. On Windows, you can use the standard decompression programs to extract the files. 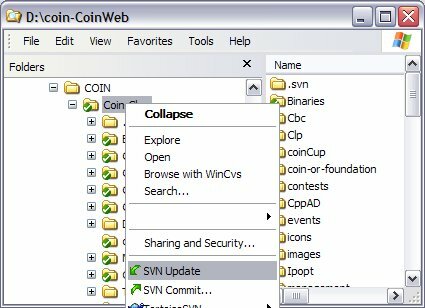 In order to download the code from COIN-OR via subversion, you need to have a subversion client installed on your computer. On UNIX-like systems, including Linux and Cygwin, the subversion executable is usually called svn. Subversion is available from ​http://subversion.apache.org. If you compile the subversion executable on your own, make sure you specify the --with-ssl flag when you run the ./configure script, so that your svn executable is able to connect to https:// servers. If you already have svn installed on your system, you need to make sure that it is able to connect to https://... URLs. You can find out if your version of svn supports this by typing "svn --version". If it says "handles 'https' scheme," you are fine. You also have the option of using some GUI clients for subversion. We have had success with ​eclipse using the ​subclipse plugin. This tool has the advantage of being cross-platform. 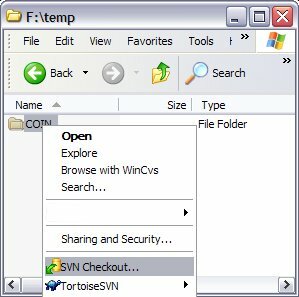 If you prefer a tool that integrates with your operating system's file manager, you can try ​ksvn for KDE, ​tortoisesvn for Windows, or ​scplugin for OS/X. 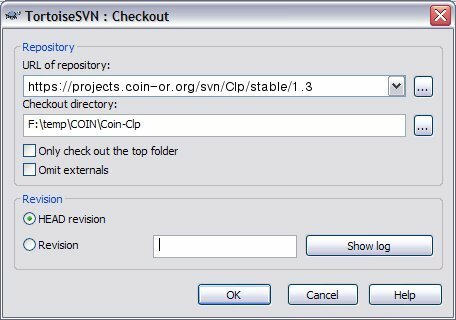 Another option is ​rapidSVN, a cross platform stand-alone client. Here and in further instructions below you need to replace the Pkg string in the URL above with the name of the particular COIN-OR package you want to get (such as Cbc, Osi, etc). Also, we assume that you chose x.y.z as the release number you want to obtain, and you will need to replace the x.y.z string correspondingly (e.g., by 2.3.5). If you want to be nifty, you can also download the current version on a stable branch, or even the latest development version. Details regarding the (recommended) release policy can be found here. You can choose any name for the directory where the source code should go (Coin-Pkg in the above example). With this command, subversion will download all the source code and other files required to compile and run the chosen package, including code from other COIN-OR projects that are required for the compilation of the chosen package. Note, however, that third-party source code (such as the code for the AMPL solver library) will not be downloaded and has to be obtain separately. On a Windows machine, you can download the code with ​TortoiseSVN. In the Checkout directory field enter the source code destination directory. The right most directory should be Coin-Pkg where Pkg is one of the COIN-OR ​project names. Some COIN-OR projects require (or can be enhanced by) third party code. In that case, you will see a subdirectory ThirdParty in the package's base directory, with subdirectories for each third party package. Please read the INSTALL or other files to learn more about this.